What Can Businesses Do About The Knowledge Graph Dominating Search Results? The expansion of Google’s Knowledge Graph may threaten the volume of organic search traffic to websites. Columnist Nate Dame explains what's changing and what marketers should do about it. Let’s just start by admitting that we’ve all Googled ourselves. And by “ourselves,” of course, I mean “our brands.” If you’ve Googled your company name recently (or the name of any company, for that matter), you’ve probably seen the Knowledge Graph at work in the rich side panel of search results. That’s just the beginning of the Knowledge Graph at work. There are many types of Knowledge Graph widgets, but perhaps most concerning are the times that Google scrapes content from websites to display it directly in search results. These developments beg many questions. Will these answer boxes start showing up for keywords that are important to my business? 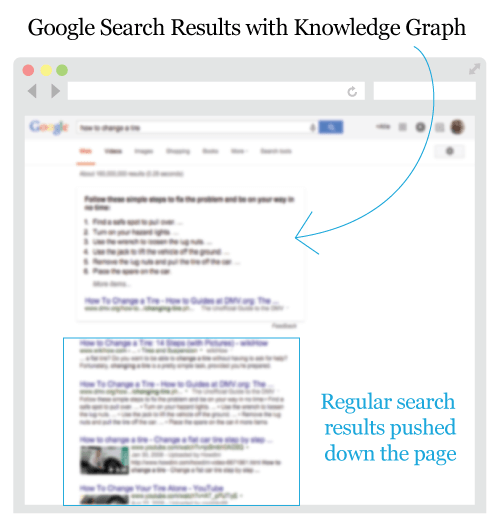 Will the Knowledge Graph begin to impact my traffic and bottom line? Do I want my content showing up in answer boxes? What can I even do about it? Google’s Knowledge Graph is hard at work expanding its reach, and every marketer should have a clear and complete game plan in response. Below are the key areas to consider. Branded searches are increasingly displaying Knowledge Graph sidebar panels for everyone from enterprise corporations to small local businesses. These panels are a powerful commentary on your brand. Not only do buyers tend to trust information from third parties, the Google Knowledge Graph is training users to look for and trust what they read in these panels. If the information in your brand’s Graph panel is accurate and complimentary, it is a welcome feature. If it is not, you have (some) power to update your brand’s Knowledge Graph information and content as necessary. 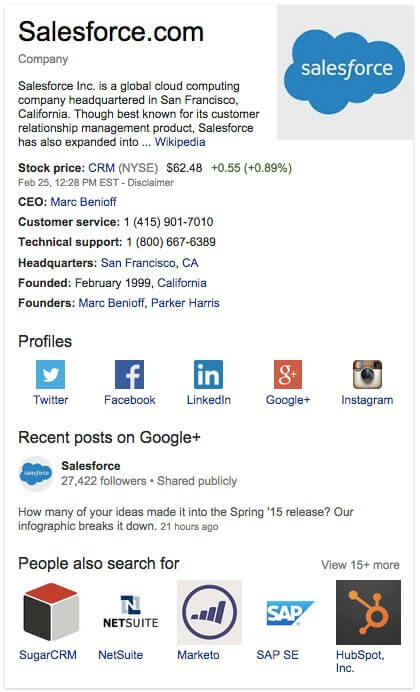 At first, the Knowledge Graph started displaying quick facts and short answers in the main-column answer boxes — mostly from Wikipedia. Websites providing in-depth information and long-form content weren’t worried about losing traffic to Google scraping. But, the Graph is getting smarter. It’s learning to pull step-by-step instructions for “How To” queries, and how to pull answers out of bigger content pieces. In light of where the Knowledge Graph has come from, and where it may be headed, getting your content scraped by the machine might be your best option. The answer box is still (mostly) linking to the original source of its information and generating additional trust for the chosen website. At first, no one wants their content to be scraped. But as soon as we see our competitors in the answer box, we revert to our toddler years and suddenly want something just because someone else has it. It would be nice to be the source singled out as Google’s trusted informer, but remember that buyers who really want in-depth information will continue to scroll past Google’s quick answer. Users who just want a fast answer aren’t users who convert to clients, so let them grab their info from the Graph and move on. Focus your time on writing magnetic headlines and creating outstanding content to attract buyers into your website. Does This Fundamentally Change SEO? So, what do you do? Do you optimize content to try to get scraped, or do you ignore the answer box and focus on attracting traffic that will actually convert? And fortunately, both of those tasks are pretty much the same thing. First, in most cases, the source getting pulled into the Knowledge Graph’s answer box is already in the first few organic results on the SERP anyway. In cases where the answer box features a page further down the rankings — although here it only jumped to #2 — the decision seems to be based on on-page considerations. That means good SEO that improves your ranking overall will also improve your chances of appearing in the Graph’s answer box. And even if you never squeeze into the answer box, your target audience is still looking for more than a quick answer. Prospects that need to make a purchase, now or in the future, will need more than the short text provided on a search result. That means prospects will still click through to high-ranking websites, although perhaps in fewer numbers. Write a strong title and H1. Ease up on the primary keyword. Clearly define the author(s) on the page. Offer unique value (not just unique content). A strong SEO content strategy is still a winning strategy, even as the Knowledge Graph keeps growing. The Knowledge Graph may impact the total number of visitors going to your site, or you may even get your best content in the Knowledge Graph’s answer box. That doesn’t change the fact that you are probably wasting your time unless you are converting your organic search traffic into leads or at least collecting their email addresses. Knowledge Graph features can be treated similarly to Google algorithm updates: they are expressions of the search giant’s constant quest to provide a killer user-experience. As with the algorithm updates, the strategies might change, but Google’s end game never does: satisfied users. The Knowledge Graph may, in fact, begin to impact your SEO traffic, but that doesn’t mean it will completely eliminate marketing opportunities. The Knowledge Graph is raising the bar for quality content yet again. It also makes converting the traffic you do earn more important than ever.